I make good this time around. Actually, I make good with plenty of time to spare – 3 days ahead of Alvin and whatever gang he’s bringing along this time around. 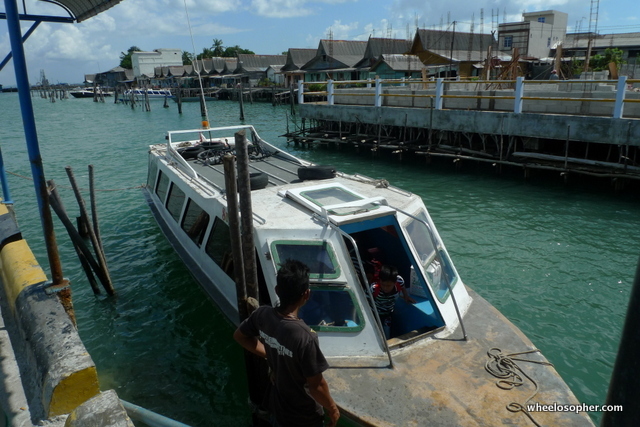 Our rendezvous is the port of Tanjung Pinang on Bintan island, a 2-hour ferry ride for them from Tanah Merah, Singapore. Sunday 7 July. I board the 10.15am flight, but not before paying RM15 to cling-wrap 2 pieces of loose baggage; the customs lady manning the x-ray machine refuses to let me check in the exposed Ikea bag, which holds the rear rack; which is too bulky for the bike bag; and other bits of stuff. So, I bagged the other pannier together with it as well; more secure that way. 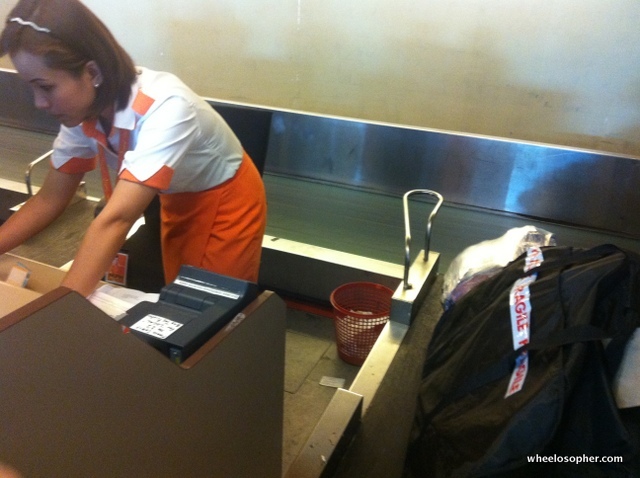 The Tern is nicely bagged and doesn’t look too out of place but the check-in girl is fussy. She grills me on the contents. “Sports equipment must pay…” she retorts unsmilingly. My feeble petition for leniency is unheeded, so I pay up – RM70. Damn airline. For RM70, I get some extras – brightly coloured ‘fragile’ stickers on the bike bag. 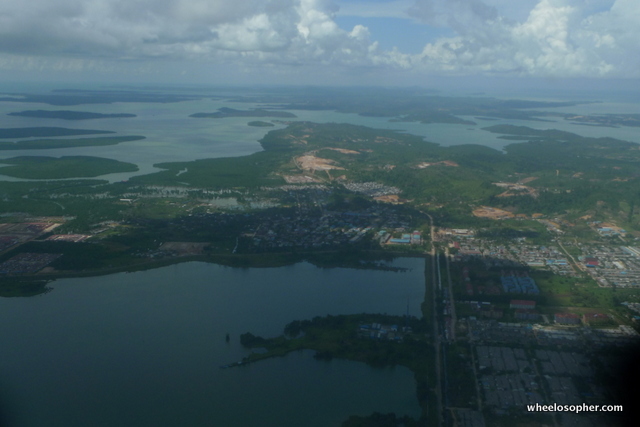 1 hour 20 minutes after take-off, I’m in Batam. Blue skies. No haze. Happy cycling is on the cards. 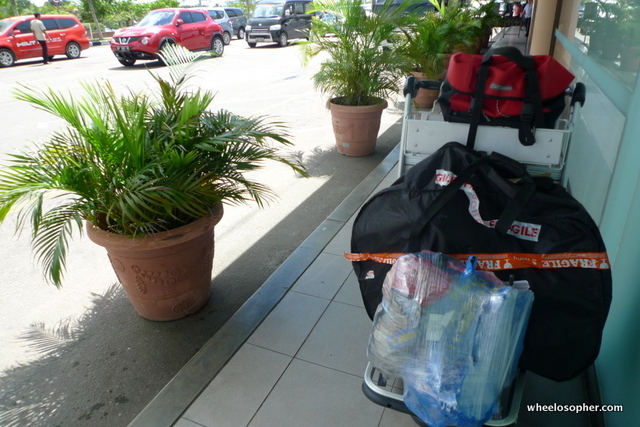 Outside the airport, it doesn’t take long before the Tern is unbagged, unfolded; with pedals and panniers in place. It’s ready for its first international adventure. I follow the busy highway out of the airport and head for Nagoya. It’s a boring ride. Nothing much to see. Tomorrow should be a little better when I make my way to Bintan, the island just east of Batam. 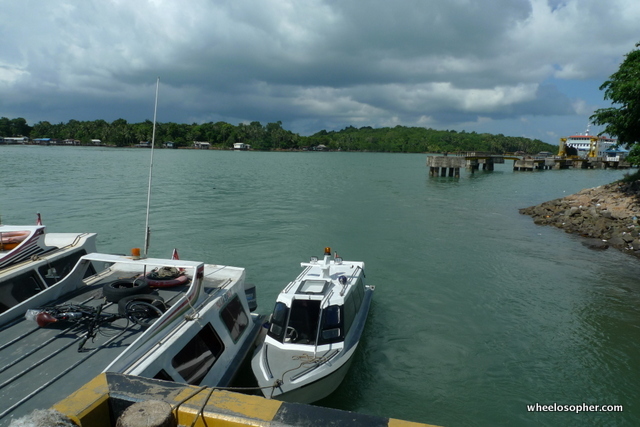 I will have to retrace my route from Nagoya back to the airport and then to Telaga Punggur, from where I’ll hop on a ferry to Tg Uban, the port in Bintan. Nagoya is about 16kms away. I have no idea what it looks like. Probably just another dull, not-too-inspiring polluted Indonesian city. What pollution? Dirty sidewalks, thousands of Toyota taxis, millions of mopeds, and men smoking everywhere. Smoking is, after all, the national pastime among 99% of Indonesian males 12 years and above. Or maybe it’s 10 now, I’m not sure. I’m right on every count. As I roll into the city, I pass a busy mall. 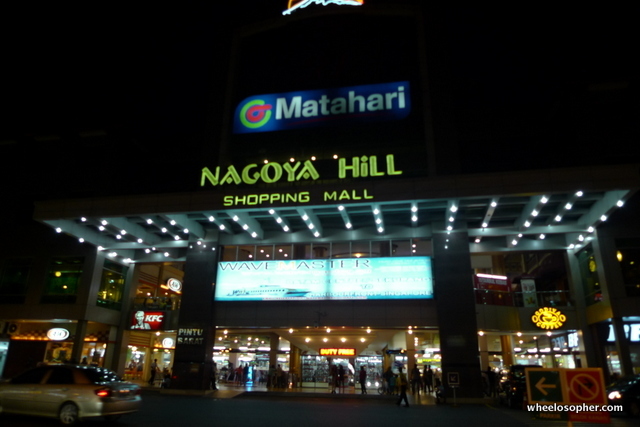 Nagoya Hills. It’s big, and kitschy. I see many budget-type hotels opposite the road. This will do. 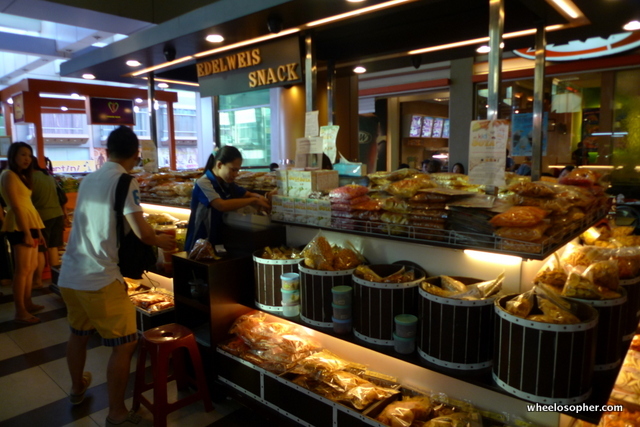 Plenty of food to choose from and some window shopping, Indonesian style. 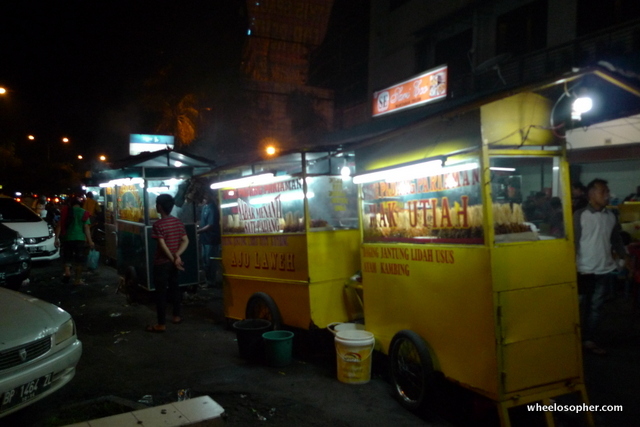 I ride once around the block and circle back to the nearest one opposite the mall – 160,000 Rupiah, or RM50. Nothing impressive, but it’ll do. The next morning after a fish porridge breakfast, I head back to the airport and the turn-off to Telaga Punggur. It’s morning rush hour. Murderous traffic all the way; the fumes are chokingly thick. For a moment I feel like I’m in a Vietnamese city. 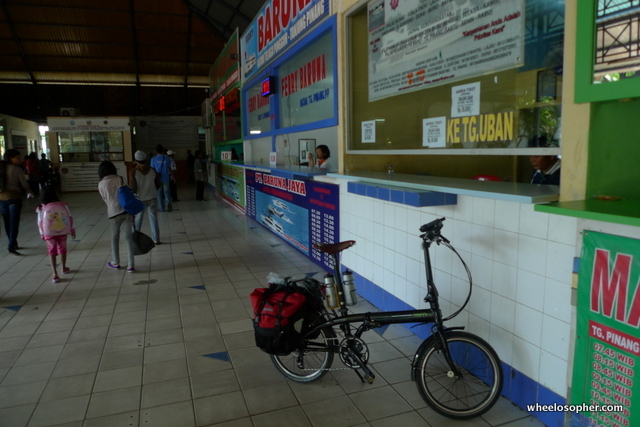 After an hour or so of riding the roller-coaster road to the coast, I reach Telaga Punggur. It’s a busy ferry port. 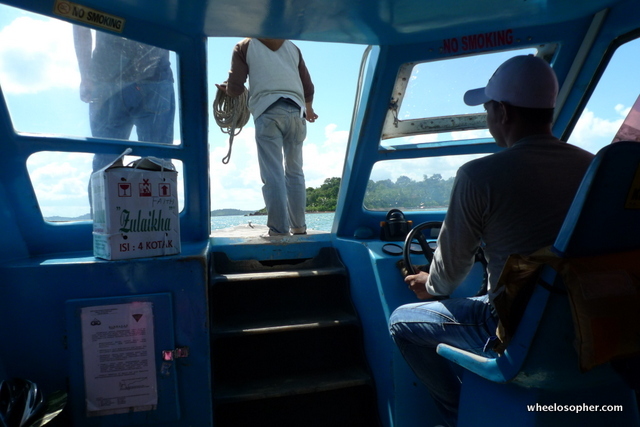 I ride up to a counter and get my ticket for the speedboat to Bintan. Rupiah 39,000. “8 minit lagi” (8 more minutes) to cast-off. 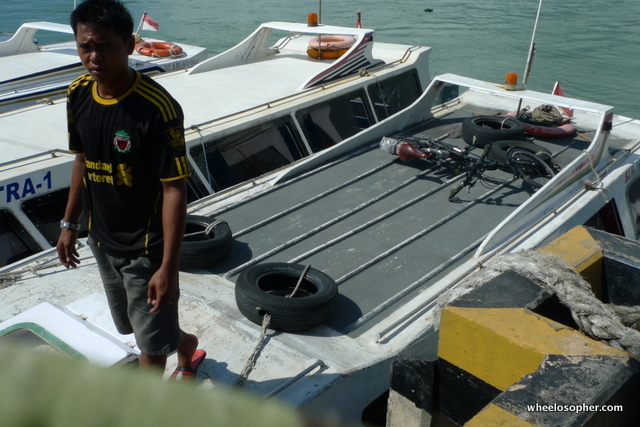 No rush, I casually push my bike to the pier and 2 extortionists appear – 2 of the boat’s crew. “20,000 Rupiah, boss”, one of them demands. That’s just for taking my bike and putting it on the roof. The guy is tanned, short, with a no-nonsense look, and cheap-looking shades covering his eyes. I halve his demands to 10,000. After all, he’s just tossing my bike on the roof. The little speed-boat is full. Doesn’t matter. It’s only a 20 minute-ride. I sit on the front-most seat, near the driver. Moving at speed, the boat is buffeted by the waves and yaws up and down at the bow; not enough to make anyone seasick, but enough keep everyone awake. I wonder if my bike is still up on the roof. 20 minutes later, we dock in Tg Uban. The suntanned Tern is still there on the roof. 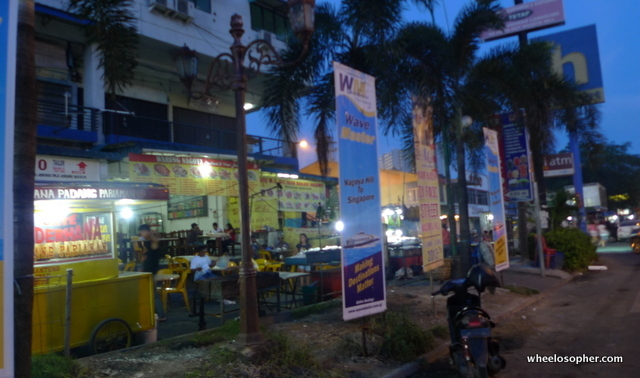 Riding out of the port, I look for a warung to fuel up on nasi padang, one of my favourite Indonesian foods. My plan is to ride towards the north-western coast, stay the night somewhere and then head east the next day towards Trikora beach about 90kms on the eastern side of the island. 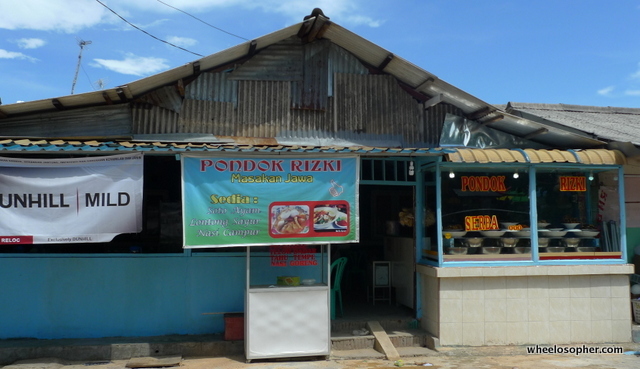 I spot a little warung that’s empty. No customers. No owner. It’s deserted. The dishes on offer on the shelf are small in portions. I deduce (wrongly, as it turns out) that it would be fresher and tastier. “Ibu”, I called out. A short, friendly-looking woman emerges from behind the shop. She serves me my selection while my stomach fairly rumbles at the sight of food. The food is fresh, but not that great tasting. The friendly lady makes up for her culinary shortcomings by being chatty. In just 5 minutes, I know almost everything about her; of Christian faith, hails from Java, married, with a couple of kids. She mans the shop while her husband, a tailor, works from home. She tells me how nice it would be to travel as she’s never been out of Indonesia, not even Singapore. “Can’t afford a passport”, she says ruefully. Life is hard for these simple folk, living from day to day. I’ve met countless people like her before, elsewhere in the world. They harbour dreams of being able to one day see the world, and in her case, it’s Singapore…so agonisingly near, yet so far (Sg is only 2 hours away by ferry). She volunteers another piece of information (distilled from reports of fellow Indonesians); that Singaporeans are haughty and look down on obvious foreigners like them, especially blue-collar types like them. “Don’t even bother asking them for directions la, they’ll just avoid you”. And yet, she would give anything to visit big, bright, modern, colourful Singapore. Just once. After lunch, I head out northwards towards Sakera, popular for its beaches among the locals. My plan is to find a place to stay the night somewhere along the way. The roads are anything but flat here; it’s undulating all the way. Some of the climbs, though short, are quite vicious. But the Sakera coastline makes up for the hard pedalling, with some respite from the climbs as the road levels out, hugging the coast. It’s mostly dotted with quiet kampong houses, and a few Chinese ones; you can always tell a Chinese community – just look for the ubiquitous garish Taoist temple that’s the centrepiece of the hamlet. I seem to be riding away from the coastline – further and further inland, until the sea disappears from sight. My GPS indicates that I’m heading towards a junction where the road branches north and then east towards my planned destination of Trikora. But that’s supposed to be tomorrow! I’m at the crossroads now. I have to decide. Go forth to Trikora? Go back to Sakera? My legs can still remember some of the climbs. Trikora wins. I do a quick calculation. It’s about 70km to Trikora, and it’s just after 2pm. I should be able to reach Ocean Bay Resort and celebrate with a beer, while I catch the last rays of the sun setting over the Riau archipelago…with my feet up on the wooden railing of the porch of my room built on stilts over the water. Visualization is a great motivational tool, but right now, yesterday’s blue skies are now partly obscured by dark, pregnant clouds to the east. The wind has picked up a little and the air is cooler. I can smell the rain. Soon, I’m tasting it. It’s only a light drizzle so I continue on, not wanting to lose any time. hi , may i know ferry schedule from telaga punggur to tanjung uban? This is because from internet, i know that there’s only two departure time daily . Hi, the two departures daily you’re referring to is the big roll-on-roll-off ferry for vehicles. 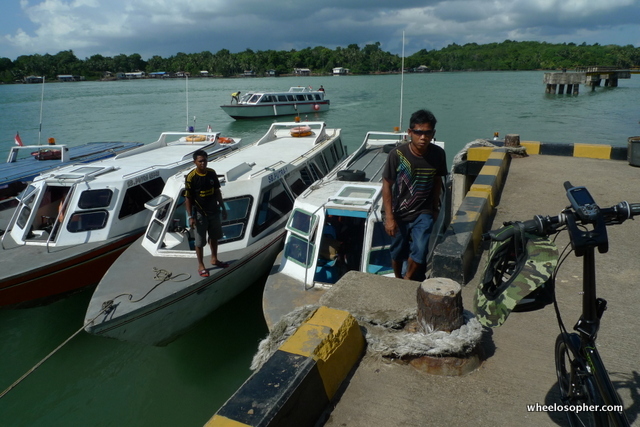 If you’re not driving, there are plenty of small passengers-only ferries that run practically all day.